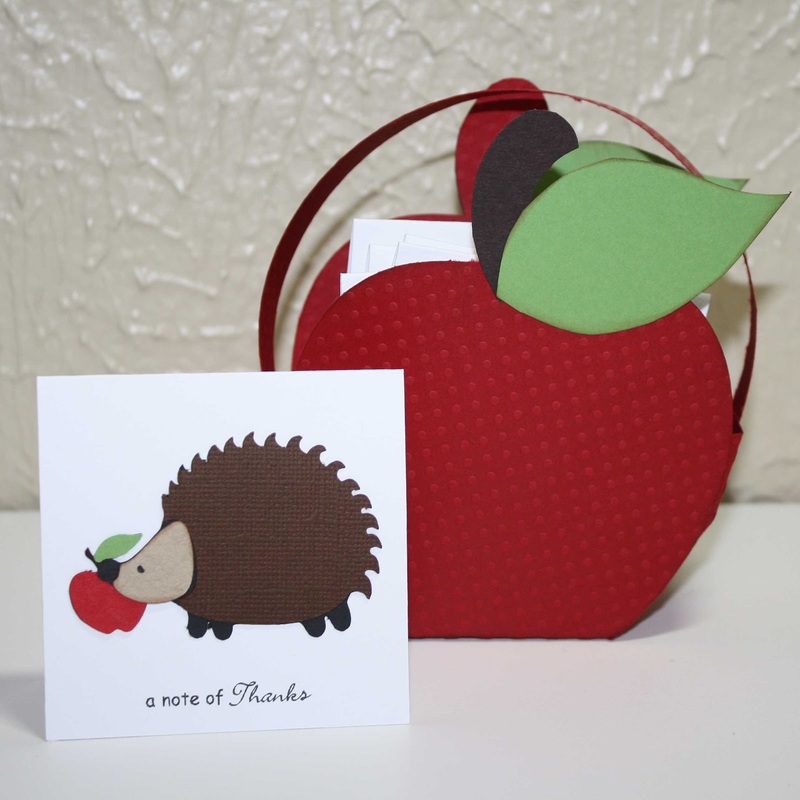 Stitches n' Scraps: Teacher's Appreciation Giveaway! Before we get to the giveaway I wanted to share the second gift idea. Today's gift is made using my favorite Cricut die cut -- the hedgehog! These little guys are so cute and very versatile. I can adapt him to nearly any season or occasion. 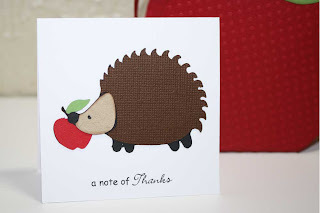 I figured everyone could always use a little thank you notes so that's how I decided on the "note of Thanks" notecards. I couldn't resist adding the apple shaped gift bag.... It is for a teacher after all. If I get a few extra minutes I plan on making a little white scallop tag to hang from the stem. These little cards measure 3 x 3 inches. The hedgehog was cut using B is for Boy cartridge and cut at 1 3/4 inches. The apple was cut using my Silhouette and the message was computer printed before I cut the white cardstock. Don't have a diecut machine to make your own notecards? Make your own without a diecut using pretty decorative cardstock OR you can enter to win a set of 6 of these little cards for yourself!! That's right, I'll send you 6 of these mini cards and envelopes. You can give them away or keep them for yourself. Please make sure you leave a comment letting me know what you have done, so I know how many entries to give you and a way to contact you. While I welcome all International fans I can only ship these to US addresses. I will randomly draw a winner on Thursday night at 9:00 p.m. central time. I'll post and contact the winner. I will ship out as soon as I have a mailing address. This is my first blog giveaway so please go spread the word. Good luck! Best wishes for your first giveaway! I just followed your blog, tweeted the blog link, and became a fan on Facebook. Thanks for entering Yolanda and the well wishes! Good luck! Thanks for joining in! I checked out your shop. Those mobiles are adorable. Good luck! Thanks Julie! Welcome to my page and good luck! Thanks for joining in. Good luck in the drawing! I think this is a great idea! I will have to do something like this for my son's teacher! Thanks for a great blog! Well I did this the old fashion way with names in a bucket.... and Yolanda you are my winner! Send me a message (sghartman at hotmail dot com) and I'll get your cards ready to ship. Thanks for all who participated and became new followers.